Or view larger version. [Huey Newton] "The racist dog policemen must withdraw immediately--". 1968. Unknown photographer. Poster. Collection of Oakland Museum of California, All of Us or None Archive. Gift of the Rossman Family. This poster of Huey P. Newton, Black Panther Party Minister of Defense, was one of the most iconic images of the mid 1960s. 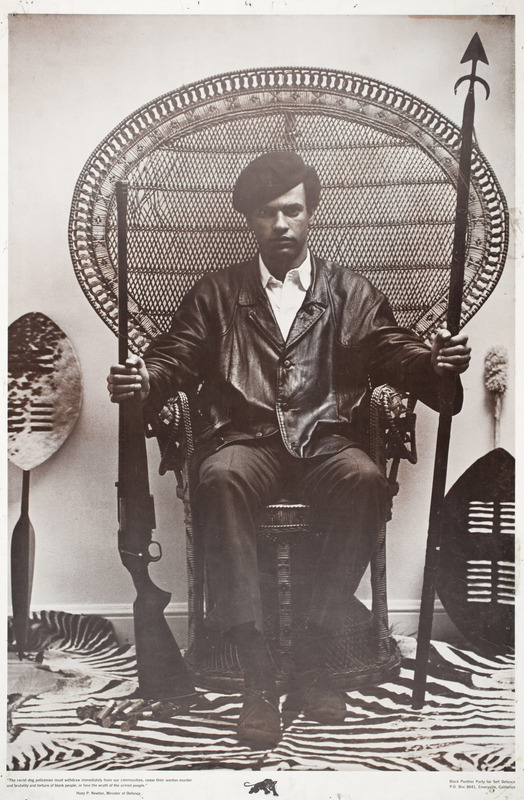 It was a posed photograph produced for the second issue of the Black Panther Party newspaper, and made the visual connection between historic African symbols of tribal defense and modern weapons for community self-determination.